Greens are easy to grow and very healthy. Members of the Brassica family, this broad description includes kale, collards, turnip, and mustard greens. The vegetables of this family are also called cruciferous vegetables. This family also includes Broccoli, Cauliflower, Cabbage, Brussels sprouts, and Kohlrabi. Most of the vegetables commonly referred to as greens are members of the same species, B. oleracea, and are differentiated only by cultivar. These plants are similar in cultivation and the amount of time they take to grow. 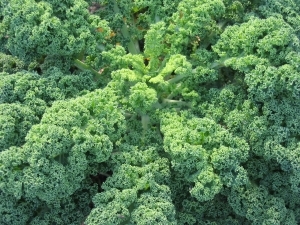 Often referred to as a "super food", Kale is high in beta carotene, vitamin K, vitamin C, lutein, and calcium. It is also high in anti-oxidants. Kale has been cultivated since the Middle Ages and is found in recipes all over the world.Easy to grow, Kale stands up to light frosts and in fact, some say the flavor is improved by a touch of frost. Varieties include Scotch curled, flat leaf and Lacinato. Lacinato kale was listed as one of the vegetables grown by Thomas Jefferson in his garden at Monticello. Kale can be started indoors and planted out up to four weeks before your last expected frost date. Collards are similar to Kale and the two are often used interchangeably in recipes. Like Kale, Collards are very nutritious and are an important source of soluble fiber and anti-oxidants. Collards are a staple in Southern cooking. Unlike Kale and Collards, Turnip greens are the tops of a root vegetable. Of the species B. Rapa, Turnip greens exhibit most of the same nutritional qualities as the others do. Turnips have about the same maturity date, like cooler temperatures and the roots are tasty when eaten raw like radishes. Cultivars of B. juncea are grown as greens, but also for their seeds. More pungent than the others, Mustard greens are also a staple of Southern cooking. Mustard has the ability to store trace elements in its plant cells making it an important source of trace elements. Its ability to bind heavy metals such as lead leads to its use in Phytoremediation. Phytoremediation is a process where plants are used to help clean-up contaminated industrial sites. The nature of some plants such as mustard greens is that they readily take up minerals through their roots. This is one of the factors that make them so nutritious. In this case, the plants, having absorbed lead and other hazardous materials, are harvested and disposed of properly rather than eaten. Broccoli Rabe or Rapini has spiked leaves surrounding clusters of green buds that resemble small heads of broccoli. Small, edible yellow flowers may be blooming among the buds. The flavor of Broccoli Rabe can be described as nutty, bitter, and pungent. Like the others in this article it is also is a source of vitamins A, C, and K, as well as potassium, calcium, and iron.